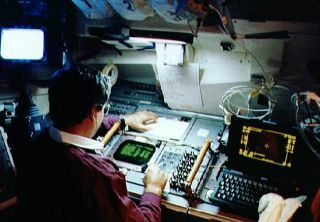 STS-39 Mission Specialist Charles L. Veach monitors an AFP-675 panel on Discovery's aft flight deck. The space shuttle was NASA's primary option for transporting astronauts to Earth orbit between 1981 and 2011. The five shuttles that went into space flew 135 missions. Crews deployed satellites, conducted experiments and studied the Earth. A handful of the missions were classified, and little is known about these secret missions, even 30 years after the fact. In the early days of the space shuttle program, some of the missions were run jointly by NASA and the military. This was in part because the National Reconnaissance Office had successfully requested the shuttle's payload bay — the part of the shuttle that carried satellites be carried into space — be enlarged to accommodate large military satellites, according to Air & Space Magazine. NRO also wanted polar shuttle missions, since polar missions make it possible to see the Earth's entire surface below (as opposed to equatorial missions, which are limited.) The Air Force went so far as to create a launch pad in Vandenberg, California for polar-orbiting space shuttle missions, but after the Challenger incident, plans to use the pad were permanently mothballed. After the Challenger disaster on Jan. 28, 1986, U.S. policy changed to allow the Department of Defense to use expendable, uncrewed rockets again. Classified shuttle flights continued with payloads that could not be shifted to the Titan IV rocket, the magazine added. The astronauts encountered considerable challenges in keeping information secret since the shuttle did not have secure information channels, and their movements and training operations had to be somehow kept separate in a normally open public agency. Here is some of what we know about the missions with DOD. The classified payload was known as Cryogenic Infrared Radiance Instrument for Shuttle (CIRRIS), which was supposed to test infrared sensors for a future surveillance satellite called Teal Ruby, according to America Space. The lens cap on CIRRIS failed to open, and the experiment failed. America Space added that Teal Ruby ended up being cancelled after the Challenger incident, which delayed shuttle flights by several years. "Teal Ruby was first shifted onto STS-39 and finally cancelled," the publication said. "By the time STS-39 lifted off in April 1991, it carried not Teal Ruby … but an updated version of CIRRIS. Apparently, by the time it would have been ready to launch, the Teal Ruby technology — considered 'advanced' in the late 1970s — would be virtually obsolete, because sensor technology was advancing rapidly." Little is known about STS-51C's payload officially besides this terse line on the NASA website: "The U.S. Air Force Inertial Upper Stage (IUS) booster was deployed and met the mission objectives." Multiple sources suggest that the satellite deployed was called Magnum/ORION ELINT, a signals intelligence program about which little is known. Before launch, no pre-flight commentary was available until nine minutes before liftoff — a first in the shuttle program. Two Defense Satellite Communications System satellites were released on this mission, according to NASA. The system is intended to support secure data and voice transmissions for military users from across the globe. This mission was supposed to be the first one using the Air Force pad in Vandenberg, Calif., but it was cancelled after the Challenger explosion. Its main mission was to put Teal Ruby into orbit, according to NASASpaceflight.com. It's probable that the crew released a satellite called ONYX, which had radar on board capable of observing targets on the ground through any kind of weather or cloud cover. According to Air&Space Magazine, one of the satellite's antenna dishes did not open and the crew possibly — although it's not confirmed officially — did a spacewalk to fix the issue. Air&Space Magazine reports that STS-28 hauled the Satellite Data System spacecraft into orbit; SDS was supposed to relay imagery from other military satellites. The magazine got confirmation on this from an Air Force officer, who was not named in the story. NASA's website simply says this was a Department of Defense mission. The payload has not been confirmed. There are many theories as to what STS-36 carried, but nothing has been officially confirmed. The shuttle's ground track took it as high as 62 degrees, which is a record for the shuttle program. NASA's website only says that this was a Department of Defense mission. No confirmed information about the payload is available. The Air Force partially declassified this mission before launch. The unclassified payload was known as Air Force Program-675 (AFP-675), which was an updated version of CIRRIS. According to NASA, the classified payload "consisted of Multi-Purpose Release Canister (MPEC)," but no further information appears to be available. The main payload for this mission remains classified, with little information about what it could be.